Automation container EUROTEC 400x300x120mm, designed for all major storage and conveyor systems | George Utz Ltd. 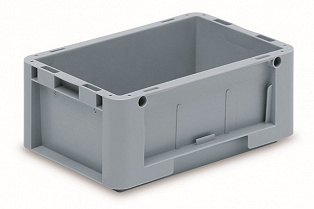 Automation container, EUROTEC, PP, Grey, ext. dims. 300x200x120 mm. Solid sidewalls, solid base, profile handle, without U-Channels, closed vertical take ups, integrated label clips on both long sides, without grip corners. Suitable for use on all conventional storage and conveyor systems.